Main water pressure is controlled at the municipal or water company pumping station. It is usually set between 150 and 200 pounds per square inch (psi). This is to overcome the pressure drop between pumping stations and elevated water towers and water storage tanks in high-rise buildings. Additionally, high pressure is required at roadside hydrants for fire-fighting purposes. To protect domestic plumbing installations and household appliances, city building codes call for a reduction in household water pressure. Household water pressure can be adjusted. Householders are at liberty to control their own in-house water pressure--within certain limits. 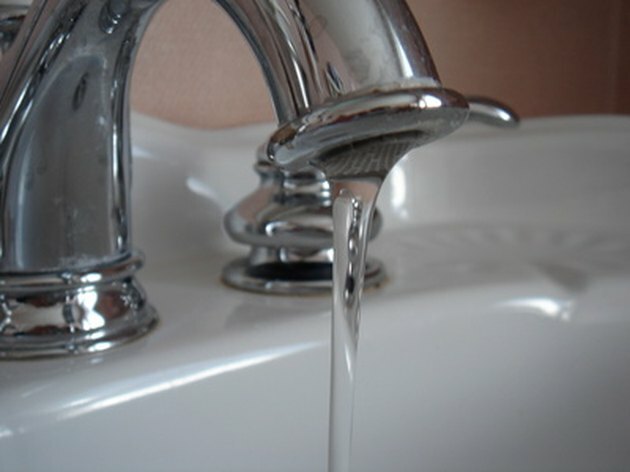 Household plumbing installations are fitted with a pressure-reducing valve between the water meter and the house. These valves are factory set to 50 psi and are adjustable up to a maximum of 75 psi. Pressure-reducing valves can be identified by the adjusting bolt and locknut protruding from the top of their bell-like domes. Water pressure is measured by attaching a pressure gauge to a hose water bib or onto a threaded appliance supply tap, such as a washing machine inlet. To measure static water pressure throughout the house, all water-fed appliances, such as ice makers and water heaters, together with all household faucets, are closed before a reading is taken, and the tap holding the pressure gauge is opened. The occupant asks a friend to keep an open line to him on a cell phone to monitor the pressure gauge during adjustment. He then undoes the locknut on the top of the pressure-reducing valve with a wrench, and turns the adjusting screw counterclockwise to increase pressure or clockwise to reduce pressure. When the desired setting is reached, he tightens the locknut against the domed housing. The householder then checks each faucet in the house. If the water flow seems to differ between outlets, he either has a faulty tap requiring servicing, a restricted pipe or a leak. Restrictions are usually caused by mineral deposits adhering to the inside walls of a water pipe, but there could be other causes. The first step is to service or replace the suspect faucets. Washers and internal mechanisms wear out over time, and aerators become clogged. The second step is to inspect all exposed plumbing for leakages. If all else fails, the final step is to call a certified plumber to diagnose the problem.